And of course Isaac Asimov himself, who, with his collaborator, intorduces each story and tells what it meant in the rise of modern science fiction. 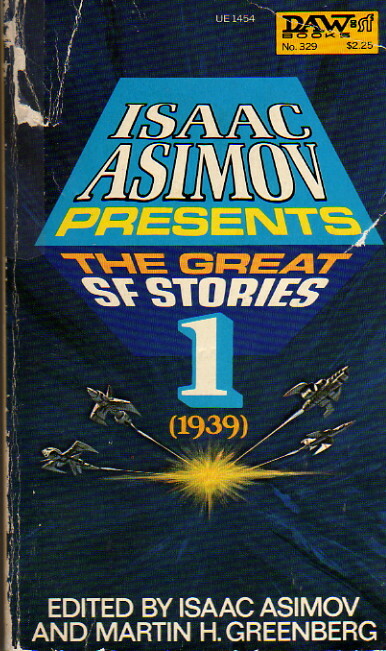 THE GREAT SCIENCE FICTION STORIES, VOLUME ONE, presents Isaac Asimov as the regular editor of this new DAW anthology series! I will confess to being not entirely convinced Martin Greenberg had a positive effect on Isaac Asimov’s career. The fact is that, as a dedicated fan with the neurotic desire to own all of the Good Doctor’s books, I am less than excited by the necessity to include among them some ten dozen anthologies which are 95% by other people. This doesn’t mean that all 110+ anthologies are worthless; many of them are excellent, in fact—but there are so darn many, and it’s such a pain to try to track them all down. Some, however, are more than worthwhile, and among the most worthwhile I would count the series of 25 volumes beginning with this one. This series is a museum of science fiction, a careful, thorough look at what are the key stories that shaped the field in its most important period, beginning with 1939 when John Campbell took over Astounding and inaugurated the Golden Age of science fiction. For the Asimov fan, of course, the entire series has somewhat less relevance, although the Good Doctor will surface periodically as it runs its course. It is nonetheless, I think, a more than worthwhile series of anthologies to read, precisely because Asimov is more than anything else a science fiction writer, and this series illustrates in greater detail than anything else of which I'm aware exactly what was the milieu within which he wrote most of his most brilliant works. (And is tremendously entertaining, too.) With these twenty-five volumes under one’s belt, one has an infinitely better grasp of the world within which the original Foundation and robot stories were written, and the world within which Asimov himself lived while the rest of the world was fighting the Nazis and Communism in the 40’s and 50’s. This is an excellent volume in an excellent series, and one is willing to forgive it the faux pas of being mostly not-by-Asimov.